Bloody Good Company: What does school look like in Ghana? 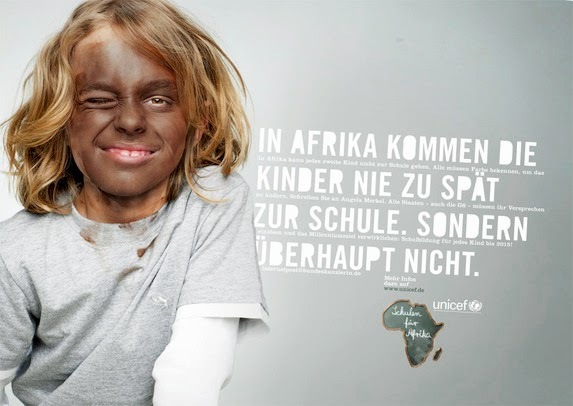 German Unicef campaign: "In Africa, children never come late to school, but not at all"
What you can see above is a campaign by the German Unicef in 2007. Apart from the fact that it is racist (painting white people black, "face painting", was once used to depict black people in media, often in an ironic and ridiculous way and therefore should not be used in such a campaign), patronzing and generalizing ("all people in Africa need our help") it also shows that most or at least some of the public in "developed" countries know very little about school life in African countries. I have been given the chance to experience school in Ghana as my working environment and I want to use this opportunity to share some of this experience with you to give you a better impression of how school can look like in an African country. Please note that I can only talk about Ghana, which is often considered as one of the best developed African countries. But before I start, let me tell you something: In Africa some children do come late for school. Okay, jokes aside. In Ghana, primary school education starts like in most countries at the age of six. Most of the children attend Kindergarden first, where they learn things like writing letters and numbers. Primary school goes up to class 6, then the JHS, Junior High School, follows. Some of the subjects are English, Ghanaian language (for example Fante or Twi), Integrated Scinece, Maths, Creative Arts etc. The Junior High School consists of Form 1-3 and the students graduate with the BECE (Basic Education Certification Exam), which is the examination after JHS in all of West Africa. Senior High School is also attended for 3 years. Basic education at governmental schools is free, however there are a lot of private schools that demand school fees. Universities, Professional Institutes, vocational training schools etc. provide higher education. The lessons mostly take place from 7am to 3pm, though this slightly differs from school to school. Every morning and afternoon there is an assembly, the national anthem is sung, often there are prayers and the teachers use it for announcements or sometimes to admonish and punish certain pupils. At the primary school, a class teacher is teaching all or most subjects, later there are subject teachers. Every school has its own school uniform, sometimes with the schoolcrest and some even have polo-shirts for excursion and the like. This brings me to another topic: excursions. Some schools do excursions. Since they are often costly, the better off schools mostly do it, but there are also schools, that value excursions so much that they do it anyway. Once I have seen a school excursion in the Kakum National Park and my school is going to another town this week to make science experiments in a laboratory. Some schools provide breakfast and lunch in exchange of a feeding fee, but even some governmental schools provide it for free, for example the schools for the deaf. Of course there also schools that fit in the cliche, where children with ripped clothes and no books and pens sit under a tree because there is no classroom. But it does not have to be like that just because it's Africa and as far as I have experienced it this is not the norm. This is how I see it in Ghana, in other countries it can be different. I'm not saying that the Ghanaian school system is perfect, which it is not, of course there are a lot of things that could be improved. However, if some people outside of Africa believe that there are no schools in Africa except for those that were built by foreign Aid organisations, then it's them who should educate themselves, not the Africans. And in general, one should never generalize like that. Not even if it's about helping someone. Did you ever wonder what an African with a master degree thinks about people in "developed" countries who believe that every African needs to be helped? Of course most people are well-meaning but if organisations like Unicef put all African countries in the place of the needy, they probably cause more damage than they do good because this is how you strengthen old and obsolete power structures.